The Miche Jessenia Wristlet is the perfect, easy-to-carry take-along for an evening date or quick shopping trip. It comfortably holds credit cards, bills, keys and your favorite lip gloss. 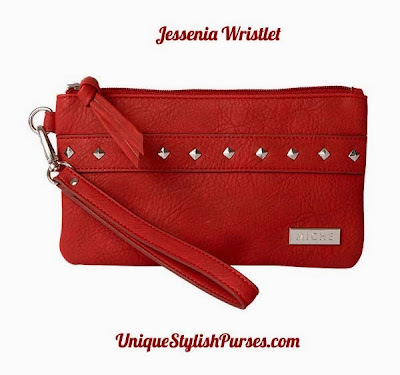 The Jessenia design features ultra-soft cinnamon-red faux leather with a row of silver pyramid mini-studs. Fabric-lined interior features a black-on-grey abstract floral print and single open pocket. Zipper closure. Dimensions: 4 ½” high x 8” long. Comes with detachable matching short strap.